Brother Sewing Machines – Outstanding Value! The kind of sewing you do determines the kind of sewing machine you should purchase. Beginning sewers, for instance, would prefer a sewing machine that has been designed simply for easy operation and maintenance while sewers who have had considerable experience may prefer a machine with innovative features such as the capability to execute an unlimited variety of projects. The crucial factor, however, remains the brand of the sewing machine, because not all of them are made the same. The Brother brand of sewing machines is one of the leading brands renowned for its high quality construction, outstanding performance, and affordable price. The Brother CS6000i, for instance, is the number one best selling computerized sewing machine with a wide array of both sewing and quilting features. 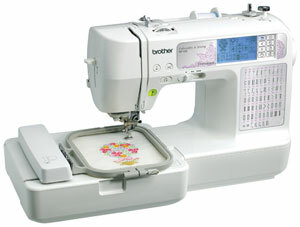 Another Brother model, the SE400, has been the number one selling embroidery machine on Amazon many times. It is an excellent combo sewing and embroidery machine and comes with 98 varieties of stitch functions and 67 different types of sewing stitches. Below are some of the most popular sewing machines made by Brother. Most Versatile - Tremendous Value! The “one-stop, express solution” for most, if not all, of your sewing needs is the Brother XL2600i sewing machine. This mechanical sewing machine is capable of providing not only regular sewing requirements but also any quilting, crafts, projects, and home décor that you want to do. Loaded with power performance feature, the XL2600i has 26 heirloom and decorative stitches that are built in, with a total of 59 stitching functions. The XL2600i’s thread cutter is built in and its needle threader is automatic, giving the user the most convenience quickly and accurately, two factors that are critical when your sewing timetable has a deadline. You can even make knitted creations with the XL2600i by using the decorative, blind hem, and integrated stretches together with various options available for quilting. These stitches are made possible with the XL2600i’s built-in twin needle. 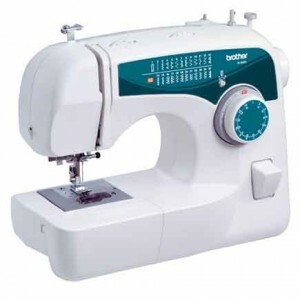 Other notable features of the XL2600i includes an automatic one size buttonhole maker that has controlled balance stitching, a thread tension dial control, an automatic winding system for convenient, no-fuss drop-in bobbin placement, a bilingual easy-to-follow instructional manual, a 25-year (limited) warranty, and a versatile free arm that enables the user to sew sleeves, cuffs, and small cylindrical items on children’s clothing. You can see my full review of this sewing machine here. The Brother CS6000i computerized sewing machine is an upgraded version of the XL2600i, already considered one of the best sewing machines in its class, and has been lauded by the majority of those who have purchased it as the number one brand of computerized sewing machine because of the accessibility of its features as well as its ease and convenience of use. The CS6000i has a start/stop button that allows its use sans the foot control. 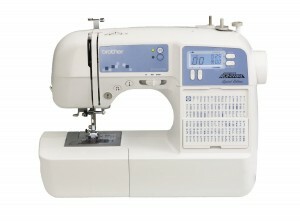 Additionally, this Brother model’s speed control is variable, meaning you can easily adjust sewing speed faster. It is also resistant to jamming due to its drop-in bobbin that can be set up easily for quick access of the bobbin thread. With the CS6000i, you don’t need to “fish” for your bobbin thread. Like all Brother sewing machine models, the CS6000i comes with an easy-to-follow bilingual instructional manual and a 25 year (limited) warranty. You can see my full review of this sewing machine here. Technology meets art. That’s how the Brother SE400 sewing machine can best be described. Considered by most customers as the best computerized embroidery sewing machine available on the market today, the SE400’s top rated performance is beneficial for both novice and professional sewers alike, a kind of rarity for most sewing machines in its class. The SE400 offers the user not only embroidery functions but quilting, garment construction, heirloom sewing, and mending, too. While the SE400 is often compared to the Brother SE350, the former is equipped with a crucial upgrade feature: a USB port to download patterns and designs and their availability as updates through a PC or laptop. This feature ensures that you have access to these latest patterns and designs in a timely manner (when they are still trending). The SE400 is suitable for intermediate level sewers, albeit there is no reason to keep beginners from using it and finding it satisfactory. You can see my full review of this sewing machine here. The Brother XR9500PRW is a limited edition model with – hold your breath now – a hundred built-in heirloom and decorative stitches, each with a set of remarkable functions. Its 7mm decorative and zigzag stitches are über wide to compliment the built-in font and enable you to some monogramming of your own. The XR9500PRW has 55 alphanumeric, built-in stitches for monogramming as well as lettering which you can do for towels, pillowcases, and even denim jackets. 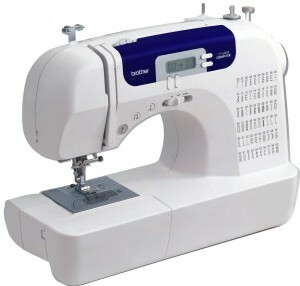 It has LED-lit stitch selector, advanced needle threading system, an automatic thread cutter, 140 easy-to-access sewing stitches, a hard cover carrying case, quilting table, and convenient stitch chart to help guide the beginning sewer. All the other functions of the other Brother models are in the XR9500PRW, too. What makes it unique from the rest, though, is the seven presser feet that include the specially-designed monogramming foot. Yet another noteworthy feature of the XR9500PRW is its capability to stitch fabrics such as fleece and elastic at the speed of 850 SPM (stitches per minute) with professional accuracy and neat precision. You can find more information about this sewing machine on Amazon, here . Why Choose a Brother Sewing Machine? Different Brother sewing machine models will have different prices, of course, because of features which may be present in some but not in others and some may even be entirely upgraded. The common functions found in every model are their versatility, the wide range of stitches which are pre-installed, their respective capacities for storing and executing patterns and designs, the 25 year (limited) warranty, free customer service phone support, and durability. If you are looking for a quality embroidery machine and you want a Brother model, then you surely have to check out the Brother PE770 Embroidery Machine. It’s certainly a top-notch model that has passed the test of time. Choose the model that can provide your needs at your sewing level. All Brother sewing machines are affordable, so price will not be an issue, according to customer reviews which, incidentally, would be your best source for information, performance ratings, etc. I’m sorry you’re having a tough time adjusting to the speed of the xl2600i. Unfortunately the less expensive machines don’t tend to come with speed controls and practicing is really the only suggestion I have for you. If it isn’t too late I suggest trading it in for the Brother CS6000i. It is only a little more expensive and you’ll have much greater control of your stitching speed. Becky, this machine has the same speed control button as the cs6000i. Look on youtube for videos on how to use that feature. If you can’t find one specifically for speed adjustment on the 9500prw look at the cs6000i. It is exactly the same in location and function. Good luck, it is a great machine. Hi! i have read your review on the brother se400 and am very much considering purchasing one but i have also been doing research on the pc420prw. Do you have any experience with that machine? I cannot decide on which would be a better sewing machine… obviously one has embroidery capabilities and one does not. Any advice you have or input would be greatly appreciated. Thank you! I haven’t had a chance to use that model yet, but what I’ve heard is all positive. The reviews for it are really good to. I hope that helps.